Oh, what a year it's been. Let's start with the biggest "little" news. Owen Elijah Valiant arrived into the World November 3rd at 6:46pm. He was 8 weeks early and weighed 2 pounds 13 ounces and was 14 1/4 inches long. He spent his first night on a ventilator receiving prophylatic steroids to help his lungs and it was all uphill from there. 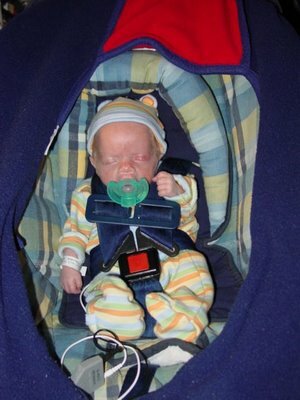 After being removed from the ventilator, he immediately graduated to room air. He started bottle feeding like a little trooper soon after that and then spent the rest of November just hangin' out growin' in the NICU. We brought him home from the hospital November 29th weighing in at 3 pounds 12 ounces and 15 3/4 inches long. He has been a good baby here at home-spending most of his days (and nights, thank God) sleeping. 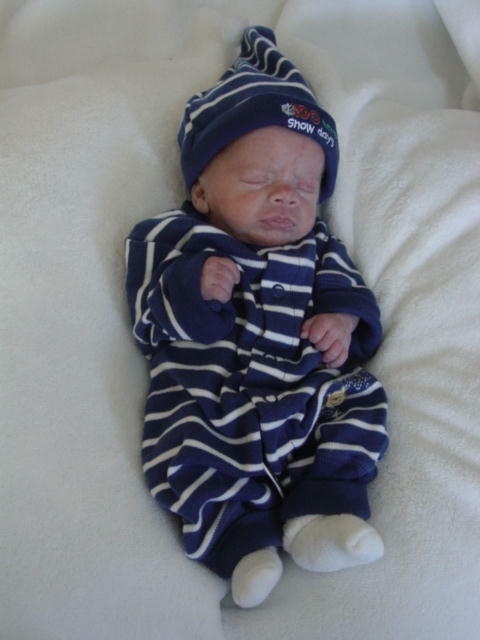 I can't believe he's six weeks old already (and shouldn't have arrived until December 26th!). Up next-Jacob Thomas. AKA Jake or Jakey or Jakes. Jacob had a great year being 2 years old. 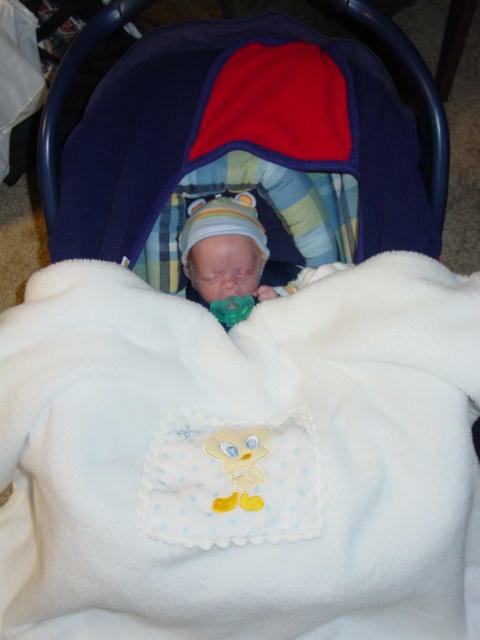 Then in early August when I went on bedrest (more on that later) he made a grand adventure up to Wisconsin and stayed with his Mamaw Becca and Mampaw Andy for the next almost 3 months. He had a great time there and was even potty trained. He made a trip back to visit us and celebrate his 3rd birthday late September and he came home to stay October 21st. He's a happy and bright little guy. His favorites in his little 3 year old world are corndogs, gum, Scooby and his brothers (and daddy). On to TJ. He had a busy year. He graduated from Kindergarten and entered the first grade! He's doing great at school. His favorite subjects are Recess and Lunch (we're so proud). He learned how to ride his bike this summer and quickly advanced to jumping ramps-all with no broken bones nor stitches (yet). He also played baseball again this summer and had a great time with that. TJ LOVES TV (too much). He's also a great reader and enjoys listening to music. He still has prospects of the building industry "when he grows up" and he really enjoyed watching the construction of our new house. Yep, that's right...we left good ole Durantt Drive for a new home on the eastside of Lafayette. We moved early July-just in the nick of time. We were hardly moved in and unpacked when our lives were turned upside down (and all around). I ended up with surgery to remove my gallbladder while 20 weeks pregnant. That was actually not all the bad but due to that hospitalization, my Doctor discovered dangerously high blood pressure (a complication of some pregnancies). So, I headed home on bedrest and spent August, September, and October on the couch. 12 weeks! 3 months! Ahhh....it wasn't that bad. The worst part was Jacob needing to go up to my mom's so he would have consistent care and not have to deal with me on the couch-how boring:-) It was also discovered soon after my bedrest sentence began that the baby (Owen) was small for his gestation (plus other concerns) and we spent the rest of my pregnancy praying for his health and growth. There is much more on this story starting back in the September archives in the blog if you want the 'whole' story. None-the-less, we were concerned for Owen's life and weren't certain that he would make it through the pregnancy. As we watched and waited, Doctors were more and more grim on his expected outcome and his growth fell off worse and worse each ultrasound. Then on November 1st, I began noticing worsening symptoms with my blood pressure and was hospitalized. We thought we'd make it a couple more weeks, but instead, I had an emergency c-section November 3rd. According to the Neonatalogist, just in time. She said Owen wouldn't have made it much longer had I remained pregnant. 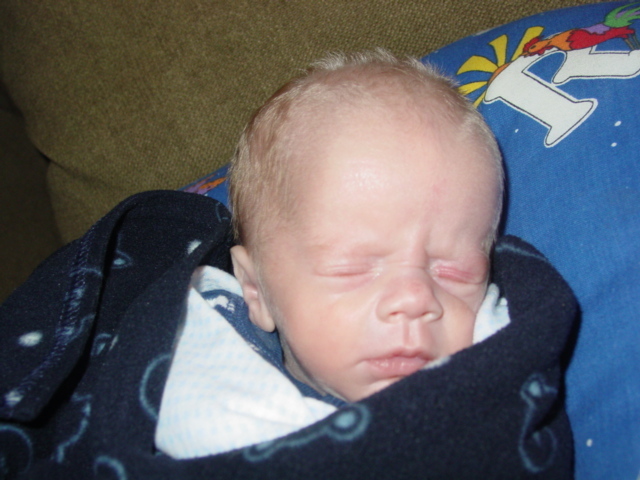 We give our Highest Praises to the Lord, for the MIRACLE of Owen's life and outcome at birth. It was hard to believe it when we were told not only does he not have the grim prognosis that was anticipated (including the inability to breathe on his own), but that he should catch up with his growth Lord Willing. 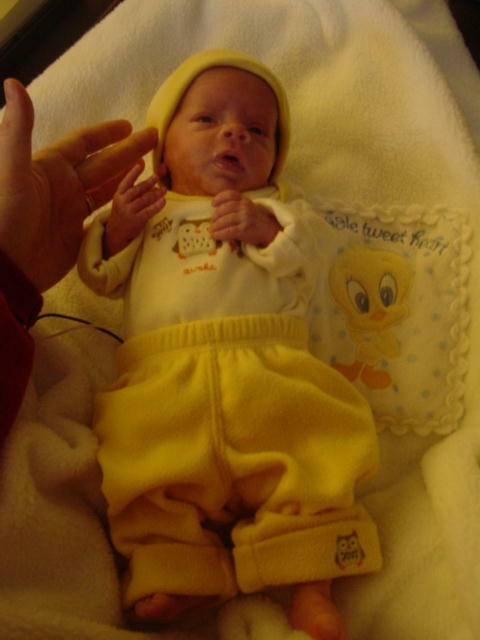 He still is quite small in both weight (imagine-2 pounds 13 ounces and down to as low as 2# 9 oz, he was about half of Jacob's birth weight at 5 #13 oz and about one third of ginormous TJ who was 8# 3 oz) and length. He may be a shorty but we are so blessed to have him in our lives! I am humbled by all the prayers, cards, calls, visits, MEALS and more meals, etc. We had such an amazing amount of support from our Church, family, and friends! Even from strangers! I have experienced an incredible amount of growth in my walk with Christ through this ordeal. Though at times I was sad and even fearful, I ultimately knew that God would see me through it. He protected me and Owen in near death circumstances. It is all so surreal. I am thankful to see all the more how good God is and how blessed I am to have the wonderful support network including the most wonderful husband ever! Speaking of the good guy...Tim is busy at work as ever at the west side Walgreens. He's enjoying one less drugstore in the triad of competition at Salisbury and 52:-) He also decided to take on a second "job" while I laid around all fall...he became a Pampered Chef consultant to keep the business going. And He's very good at it, I'm happy to say (or am I?). He was a trooper taking care of everything-and I mean everything for the past 4 months. We did take a week off to enjoy a Carribean Cruise in the Spring. It was the 2nd awesome trip we earned with The Pampered Chef. He enjoys all 3 boys so much and is often found draped with kids on the couch with books or on he floor with mounds of leggos. He's such a great dad! It seems like there should be more to report from 2006...it really was a crazy year. I like to think of it as the year of the baby. I went from growin' Owen, to owin' on Owen, to Owen now growin'...thanks for reading our annual update. We hope you take time to enjoy the company of family and friends this Holiday season and celebrate the true meaning of Christmas. Luke 2:11 For today in the city of David, there has been born to you a Savior, who is Christ the Lord. It's not a question...he pees-a lot. He pees on me, his clothes, his blankets-everything. It's like an instinct. Hmmm...mommy is removing my diaper-I think I'll pee. There's no time to even think-no matter how gingerly I remove the diaper-he pees. If I am lucky enough to remove the diaper without the fountain of Owey errupting, he'll pee as I swoop the new diaper under him. he's like ole' faithful. You'd think I've never had a boy before. As if peeing weren't enough...he poos too. 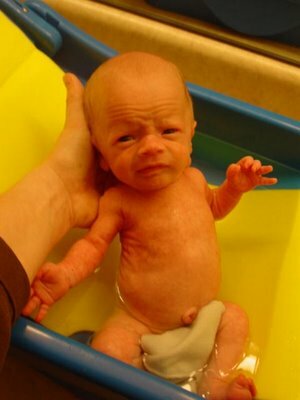 Nope, not just your average baby poo either. It's rocket blast poo. I've never seen poo shoot so far from such a little hiney. And, he poos with EVERY diaper change. He poos in fresh diapers best though. He's a good baby though-otherwise. He sleeps A LOT. I'm not complaining. Actually, it's kinda concerning. I was told he'd sleep 16-20 hours a day. He sleeps more like 23 hours. He sleeps while eating, while peeing, while pooing. He just sleeps. When he does wake up, he doesn't really focus in on us or make eye contact. It's a concern of mine and I'd appreciate prayer that one, I'd be comforted that it's normal and two, that there isn't anything wrong with his vision. I can't believe he's 5 weeks old. I'm guessing he's over the 4 1/2 pound mark by now-but we don't have a scale that measures ounces. Where did the month go? Oh yea, I slept it away. And how did I put on so much weight? I weigh 4 pounds 1 1/2 oz...I'm porkin' up! Does my diaper make my bottom look big? He, he. All is pretty good in my baby life. I sleep a lot but, not always when mom wants. I went to the doctor today-he was cool, Dr. Ho-mommy says he's the best! It was really cold outside though-no fun. Have you ever thought about a mother's love for her children? It is truly unconditional. They do so little to deserve our love. They mess up so much and require so much effort. Our children can drive us crazy. They can make us question our sanity. Yet, we still love them and have such sweet affection for them. This is how I think of God sees us as His children. I mess up. I loose control. I try to do things on my own but ultimately, must turn back to Him for help. He responds as a mother does to her children. With open arms. He doesn't care how many times we mess up, nor how much effort we require. He understands our and responds to them lovingly-whether it's 2am or a weekend, or Holiday, etc. He always takes our calls too-never having to leave a message. No, not literally-but He's always available. In fact, have you ever found yourself saying "How many times am I going to tell you_______?" or "If you would've listened to mommy..."? I posted many verses on comfort because it's what I've needed lately-comfort. It's hard being a mom. It's hard being human. But, God can comfort me no matter how nuttso I feel...or act. Best part-He forgives me for it. He made me and He loves me. 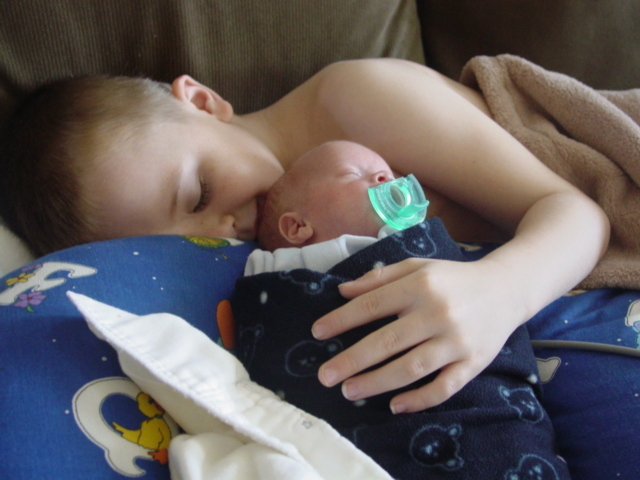 I am so thankful that He allowed me to have children, to be able to love them. They don't do anything to deserve my love-thus, they can't do anything to loose it. And it's the same way with God-we don't do anything to deserve His love, and thus, we can't do anything to loose it. I hope you find comfort in your day!